We should think about the ocean because all kinds of life lives there. There is a much larger variety of animals in the ocean than there is on land, from the smallest virus to the largest animal that has ever lived, the blue whale. Life in the ocean has been discovered in unusual places, for example, in complete darkness, near poisonous gas, or on top of underwater volcanoes. Most of the living space on Earth is in the ocean. 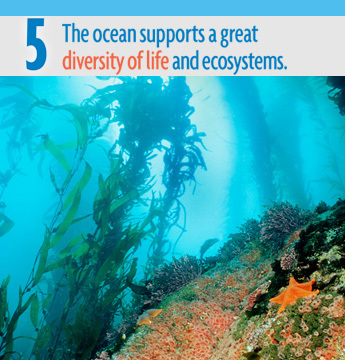 5: The ocean supports a great diversity of life and ecosystems. a. Ocean life ranges in size from the smallest living things, microbes, to the largest animal on Earth, the blue whale. b. Most of the organisms and biomass in the ocean are microbes, which are the basis of all ocean food webs. Microbes are the most important primary producers in the ocean. They have extremely fast growth rates and life cycles, and produce a huge amount of the carbon and oxygen on Earth. c. Some major groups are found exclusively in the ocean. The diversity of major groups of organisms is much greater in the ocean than on land. d. Ocean biology provides many unique examples of life cycles, adaptations and important relationships among organisms (such as symbiosis, predator-prey dynamics and energy transfer) that do not occur on land. e. The ocean is three-dimensional, offering vast living space and diverse habitats from the surface through the water column to the seafloor. Most of the living space on Earth is in the ocean. f. Ocean habitats are defined by environmental factors. Due to interactions of abiotic factors such as salinity, temperature, oxygen, pH, light, nutrients, pressure, substrate and circulation, ocean life is not evenly distributed temporally or spatially, i.e., it is “patchy”. Some regions of the ocean support more diverse and abundant life than anywhere on Earth, while much of the ocean is considered a desert. g. There are deep ocean ecosystems that are independent of energy from sunlight and photosynthetic organisms. Hydrothermal vents, submarine hot springs, and methane cold seeps rely only on chemical energy and chemosynthetic organisms to support life. h. Tides, waves and predation cause vertical zonation patterns along the shore, influencing the distribution and diversity of organisms. Through an introductory lesson, students will learn about the important role salt marsh and estuary ecology play in the health of the Gulf of Maine watershed. Using binoculars, temperature loggers and microscopes, students learn about the ecology of the salt marsh and the unique adaptations marsh organisms have developed to survive in this habitat. Interactive activities teach students about the uses of the marsh through time. Educators will receive materials to assist with field trip planning and pre-and post-trip activities. This program varies seasonally.